A 15-year old physical challenged primary four pupil of Demonstration Primary School, Kawo, in Kaduna, Jamilu Sa’ad,, who said that she was brought to Kaduna to beg for alms, has abandoned that [begging] to acquire education. Sa’ad stated this in Kaduna while receiving a donation of tricycle for the disabled from a Non-Governmental Organisation, Hope for Communities and Children Initiative. According to him, “My parents are dead. Being a crippled and an orphan, I was brought to Kaduna to beg for alms. But I envy seeing children in my area going to school every morning. “After a while, and against all odds, I decided to abandon begging to acquire education. “I bought tricycle with the little amount I raised from begging to ease my movement, but got spoilt after a while and could not fix it”, she said. He pointed out that as a physically challenged person, acquiring education was nearly impossible especially if ones parents are death. “But with courage and resilience I want to acquire education so my life could change for the better, and thanks to hope for communities and children initiative for supporting me in achieving my dreams. “I will study till I acquire at least a National Diploma. I assure all those who believed in me that I will not let you down, “he added. Sa’ad said that the director of the NGO saw him crawling to get to school and offered to help him get a tricycle, “and today she has fulfilled her promise. I am so thrilled and grateful. 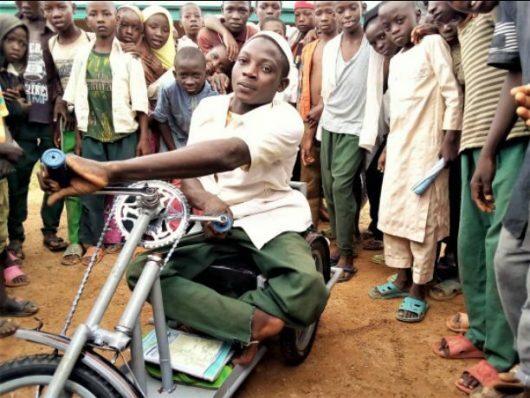 The Executive Director of the NGO, Hajiya Hadiza Umar, explained that the NGO provided the tricycle for Sa’ad to ease his movement to school and enable him socialise with his peers. Hajiya Umar said, “I was deeply touched when I saw him crawling to get to school. I felt duty bound to assist in my own little way to encourage him and others like him who are passionate to acquire education. “If he is this zealous without help; he would do better when supported, no matter how little, “she said. She called for a concerted effort toward educating children with special need, adding that government at all levels and relevant stakeholders must work together to make a headway. She said that there are thousands of children like Sa’ad, who could not attend school because they are physically challenged, with no one to help or encourage them. According to her, children with special needs deserve the same free and appropriate education that all children received. “Therefore, governments and relevant stakeholders must work together, pool their resources and expertise to meet the educational needs of children with special needs.”, she stressed. Also speaking, the Executive Chairman of Kaduna State Universal Basic Education Board, Malam Nasiru Umar thanked the NGO for the gesture. The chairman, who was represented by Deputy Director School Services in the board, Malam Yahaya Khalid, said that the gesture would help the state achieve inclusive education. Umar appealed to all relevant stakeholders to emulate the NGO and support the government in meeting the needs of children with special needs.